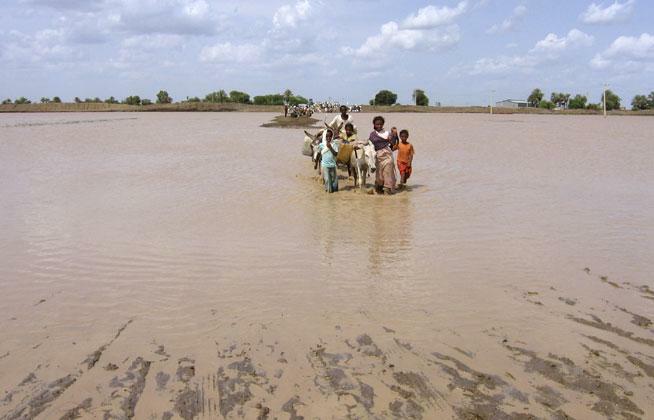 13 of Sudan's 18 provinces had been affected by flooding, Sudan interior minister said on Thursday. Ismat Abdelrahman stressed that floods and heavy rain have already killed 76 people. Also thousands of homes were destroyed in recent days. 3,206 houses were completely destroyed, other 3,048 were damaged in the eastern province of Kassala, one of the worst hit areas. In El Gedaref state, El Hawata locality has been isolated since floods and rains washed away the landfill road which connects it with other the localities. Mohamed Mahmoud Beatie, MP for west Hameshkoreib constituency said there are about 800 families in Hameshkoreib that do not have daily access to food, and more than 1,200 other families receive food and drink in a Koran. More than 1,800 head of cattle have been lost. Dozens of families are still missing in Kassala in eastern Sudan after the flooding of El Gash River during the past week. The Nile is at its highest levels in more than a century, swollen by heavy rain in many parts of the East African country, according to the water and irrigation ministry.